Tonight on CBS their crime comedy-drama Elementary premieres with an all-new Sunday, December 18, 2016, season 5 episode 10 Fall Finale called, “Pick Your Poison” and we have your Elementary recap for you below. On tonight’s Elementary Season 5 episode 10 as per the CBS synopsis, Watson (Lucy Liu) and Holmes (Jonny Lee Miller) search for the person who is using her medical license to sell drugs. Did you watch the last episode of Elementary where when Shinwell comes to Holmes and Watson for help after he was framed for a gang killing, they had three days to find the real murderer before he was arrested and sent back to jail? If you missed it and want to get caught up before tonight’s episode we have a full and detailed Elementary recap, right here. #Elementary starts with Sherlock coming home and looking at a chess table. Shinwell restored it as a thank you gift for him and Joan. He says he found it downstairs and fixed it up. Shinwell says thanks again. Sherlock says the table was evidence in a 78-year old murder case he was trying to solve. Shinwell thinks he’s teasing and Sherlock confirms he’s not. Sherlock says the chips in the table he fixed were from the stabbing. Sherlock says now they both destroyed evidence. Shinwell’s phone chimes and he says he has to go and says please tell Joan goodbye then he goes. Sherlock tells Joan that Shinwell is still involved with SBK and she says he’s still gathering intel to bring down SBK. She says she hooked up with Detective Guzman at the Bronx gang squad. Sherlock is upset and Joan says he’s finishing what he started. Joan says he won’t just leave town and Sherlock says he hoped he’d get out of the gang. Joan says he’ll hopefully be registered as a CI for the NYPD in a few days. 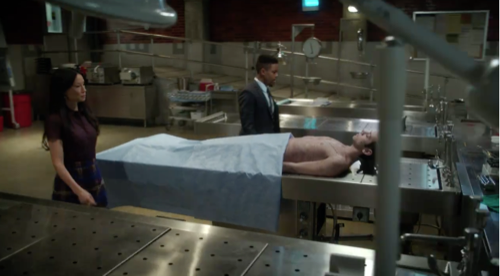 Marcus texts Joan to meet him at the morgue but only wants him. Jeffrey Banks OD’d and they look at his body in the morgue. Joan asks how she can help. He asks if she’s seen the guy before and Marcus says she’s the one who wrote the prescription that helped him overdose. Joan meets with the DEA investigator, Sherlock and Gregson and the captain tells him that they’re saving him time. She didn’t write the prescription. The detective says there are more than one prescription out there and Joan says she hasn’t been in practice for a decade. The detective says he has no evidence that her identity has been stolen. Marcus asks Joan how it went and she says her license is suspended. Joan wants to find the perp and thanks Gregson. Marcus tells her that the address on the scrip went to a mailbox facility and a burner cell. Marcus gives her the prescription info and says it’s handwritten. He says it’s in New Jersey. Marcus says the system to make sure that people aren’t doctor hopping doesn’t connect well state to state. Sherlock asks Marcus for the number of the Bronx gang unit. Sherlock meets Guzman and tells him not to meet Shinwell about SBK. The pharmacist hesitates to help Joan until she provides her ID. Joan looks at the prescription and says it’s not her handwriting but other than that, it’s medically accurate. Joan says the use of her middle initial helps since she only used it when she worked at a hospital in Queens. Joan comes in to find Sherlock with a dummy with a knife in it and she questions his hobbies. He’s working on the case from the table. Sherlock says her contact information at the hospital in Queens has been replaced. He says he checked out the system because it was easy to break into. He looked for other doctors with changed information that went to prepaid mobiles like hers. He found three other doctors also had their identities stolen and says Marcus is checking it out. Sherlock says he saw Guzman and told him not to take Shinwell on as a CI. Sherlock says the guy is not good enough to play undercover. He reminds her of his mistake with the FBI guy. Joan identifies the doctor she thinks stole her ID – Dr Krieg. They head to her office and find her and another woman dead in her office. Sherlock checks the other woman’s wallet and her name is Marla. Joan shows him evidence that someone stole prescription pads. They stole enough for 10,000 illegal prescriptions. Sherlock walks Gregson through the crime scene of the two women and how it progressed. Marcus and Joan have gone to talk to the receptionist. Sherlock says they’re still waiting on time of death. Sherlock says Dr. Krieg was running a pill mill using several identities. Gregson wonders if it was a patient. The dead woman is supposedly the mother of a patient but they’re waiting to hear from the family. Gregson says he’ll call the DEA so they back off Joan. Marcus and Joan meet with Marla’s son Ethan who’s on crutches. His dad says it’s not his fault that she went alone. Ethan says he’s been sick since he was a kid and his mom dealt with everything. He says he had an appointment conflict so his mom went to discuss treatment options. Ethan says he has no diagnosis – they call it non-specific auto-immune disorder and describes his symptoms. The dad says he doesn’t live there since he and Marla split. They tell them they think Dr. Krieg was running a pill mill and ask if his mom might be involved. The dad says to check the house. Ethan says he saw a guy in the doctor’s waiting room who was in his 20s and was in bad shape, shaking and sweating. He says Dr. Krieg kicked him out and the guy was mad. Shinwell is with SBK and points out a guy nearby that he thinks followed him. The other gang banger says he’s tripping. Shinwell says he’ll finish with them later and walks off briskly. The guy tracks him. Shinwell goes into a store and to the back. The guy doesn’t see him skip out. Shinwell goes to Sherlock’s place. He tells him he was followed. The guy following him was hired by Sherlock and is there at the house. Sherlock says the guy has been following you since last night. Marcus calls and Sherlock says he’s no good as a CI and quit why you’re alive. Sherlock says Shinwell owes him and says acting as an informant is not the way to get your life back on track and says get away from SBK. Shinwell promises to think about it. Marcus leaves a message about ballistics from the shells they recovered. It’s from a mugging unsolved from a couple years ago. They bring in the victim who says the mugger shot him in the arm. The victim says he didn’t see the guy clearly. Sherlock doesn’t like his answers and says he’s lying. He rattles off some science to prove he’s lying. Sherlock says he thinks he was trying to carjack someone and got shot. Marcus says tell us the truth and we won’t press on the lie. The guy says a silver Lexus had a man and woman in it and he tried to steal the car but the man shot him. He says it was in Hempstead near a furniture store. Patrick tells them he did shoot at the carjacker but didn’t tell Marla because he was cheating on her with one of her employees. He says his ex-wife was a saint and he’d never hurt her. He says the gun should be in the garage and Marcus says he searched it earlier. Then the husband pauses and says someone might have taken it and says lots of people are in and out of the house. Marcus says they can’t confirm his alibi. Patrick says to ask his son Ethan and he’ll tell him that his parents got along. Ethan is having physical therapy when Joan comes into the room. The therapist says he owes her make up time then steps out to let them talk. Ethan says his mom would want him to keep going. Joan says her colleagues are with his dad because his gun killed Marla. Ethan says that must be a mistake. Joan asks if he knows anything and he says you can’t imagine what you’re asking. He says his mother was everything to him. He says he has no one in his life but her and he can’t believe his dad would hurt her. He says he needs his dad now. Ethan calls for the therapist and says his dad is innocent. Katie comes in and Joan leaves. Sherlocks comes home with a bag and says he got supplies. He says they searched all over and can’t find the murder weapon or the prescription pads. He says he’s making progress on the chess club table and has to unfix what Shinwell did. Joan is going through phone records and emails looking for clues. She says Marcus called and his alibi has now been confirmed by a pizza delivery guy. She hands him some files and says Shinwell met with Guzman and he’s going to be a CI. Sherlock isn’t pleased. Joan spots something strange and says Marla called one of the fake doctor’s cell phones. Sherlock also finds some dodgy phone calls. Marla was doctor shopping and Joan pauses. She says they need a warrant. They have Dr. Krieg’s file on Ethan. He’s not sick, his mother was poisoning him because she’s got Munchausen by Proxy, the condition where people hurt a loved one for attention. Sherlock and Joan think that Ethan killed his mother and the doctor to punish them. Gregson wonders if he can walk and Sherlock says the physical therapist might have helped him. Ethan had been with Dr. Krieg for a year and she ran out of tests. Marla was going to move to a new doctor and called one of the fake IDs phones. Marla left a voice mail that’s inconsistent with what she told Dr. Krieg. They see meetings in her files with Ethan alone in addition to Ethan and Marla. Joan says since Ethan is 18, Dr. Krieg didn’t call child protective services. Joan gets a call from Marcus who says she’s right about Ethan. He was upset last night after the search. Turns out he left in a car after the search and now he’s in the wind. Joan says the therapist is in the clear so they don’t know who is Ethan’s accomplice. She says the DEA agent sent this over and she shows him other pharmacies where bogus prescriptions were filled or turned away. Sherlock points out a dot that was dated the night of the murders in Fort Lee, New Jersey. He says the only place he could have met an accomplice is at a doctor’s office. Sherlock says maybe his accomplice was paid in prescription pads. Sherlock says an addict will always fill a drug order as soon as they can. They bring in Ethan and Joan speaks to him in interrogation. She says the addict who helped him, Todd Fisher, told them where he was. Joan says they found the gun in his hotel room. Joan says she has information for him. She says she thinks his mother was stealing drugs from his grandfather to poison him. She says the staff noticed some drugs have gone missing and a nurse was fired. Joan says these drugs are likely the cause of his problems. She says his symptoms should improve. He asks if she’ll tell the police why he did it – he says his mother stole his life. Joan says Dr. Krieg was selling illegal prescriptions to addicts and she tried to help him by telling him what his mother did and he killed her anyway. She walks out. Shinwell finds Sherlock in his apartment and isn’t happy. He has the chess table with him and says he’s loaning it to him since they have to spend time together. Shinwell says you think I’ll be dead soon anyway. Sherlock says he will train him properly to be an informant. He says he wants him to survive it and will teach him how to get the information he needs and Shinwell asks what it’ll cost him. Sherlock says the only repayment is him to be an informant for them occasionally, too. Shinwell sits down to play chess against Sherlock who grabs a stool. They set up a match.